It’s interesting how things have come full circle. As a teenager, I used to buy Australian-published electronics magazines each month, and tinkered with making some projects. At that time, we had Electronics Today International, or ETI, and Electronics Australia. Early in the 90s ETI disappeared, and EA hung around a while longer. At some time some of the former EA staff set up a new magazine, Silicon Chip, which I have looked at from time to time. Suddenly people are making things with electronics again, but the focus has shifted from analog circuitry to computer technology, and now that we have affordable programmable devices the hobby market is born again. I was quite excited to discover a new magazine launching in Australia, called Diyode. 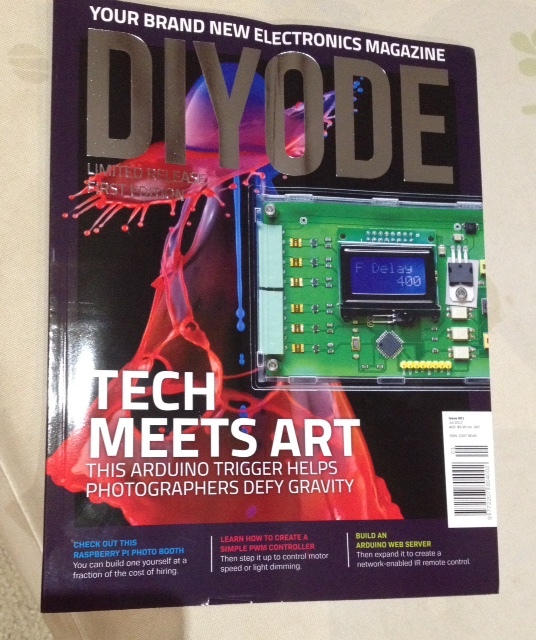 First new electronics magazine in the country for almost 30 years. I’ve subscribed, in print as well as digital, and the first issue arrived yesterday, a few days ahead of the newsstand launch. Good thing it’s school holidays and I’ll have some time to read it. Looks good, like some of the better UK magazines with full colour page spreads and some good practical articles.